Welcome back to Member Monday. Today we feature a poem by Writers Forum member, Linda Boyden. Welcome, Linda. I bought to ease his chills. though it is too cold. for his long march to the stars. and hunt for his, for him. Welcome back to Member Monday! Today we feature a story by Writers Forum newsletter editor, George T. Parker. Here’s little more about the piece from George himself. Author’s Note: This fictionalized story is based upon a true incident on a trail crew in Yosemite. I didn’t see it happen. It was a campfire story we heard from the trail workers leading our crew of an incident that had happened years before. Hammers clanged on rock. A faint granite dust fog hung low to the ground. Miguel and Bear each worked his doublejack on the weak, weathered, and rotten granite rocks in the trail tread. Neither spoke. They didn’t need to. The borders of the causeway section were finished. All they had to do now was break down the decomposing granite rocks to fill the trail tread, cover the crushed fill with dirt, and this section of trail would be finished. Miguel had been working trails in Yosemite for over fifteen years, had been a trail boss for three of those years, and this marshy section would finally be crossed off his ‘to do’ list. This particular section had been annoying him for a couple of years. This year, this section of high-traffic trail between Yosemite Valley and the Merced High Sierra camp had climbed to the top of the priority list. The rest of the crew worked about a half mile above them, closer to the Merced camp. When Miguel and Bear finished here, they would bump up ahead of the rest of the crew to the next trouble spot on the trail. It was a hot August day. Miguel and Bear worked shirtless, and their blue jeans carried a lot of Yosemite dirt around with them. Miguel glistened with sweat. A green bandanna around his head kept sweat out of his eyes. Bear’s hairy mass covered up any sweat. His head was bare, but he did occasionally have to wipe sweat out of his eyes with a bandanna he kept tucked into a back pocket. This was the perfect life for Miguel and Bear. They could not imagine any life better than working on Yosemite trail crews in the Backcountry. As their hammers clanged, hikers rounded the corner below. They appeared out of the trees, three of them. Two guys and a lady. All three of them could have just stepped out of an REI catalog. They sported brand new backpacks and hiking boots. They hiked with the latest style hiking poles. (Ordinary people might call them ‘ski poles’.) Colored piping around the top of the lady’s socks peeking above her low top hiking boots even matched the color of her hiking shorts. The hikers carefully picked their way through the rubble in the trail. After they passed through, Miguel and Bear stepped back down onto the trail, preparing to start swinging again. Miguel and Bear had been dealing with that question since they were Corpsmembers in the CCC. People often confused them with state prison inmates as they worked alongside California’s highways or state parks. Miguel and Bear were used to hearing that question. This time, though, Miguel had already planned a different sort of response. Miguel dropped the head of his doublejack to the ground and said “Yeah. Didn’t you see the guard with the shotgun down there around the corner?” He looked at Bear. Bear grinned. Miguel said to Bear “You hear that?” Miguel threw down his double jack and ran up the hill. Bear was right behind him. The three hikers stood frozen in place and watched the two men disappear through the trees. Welcome back to Member Monday. Today we feature a piece by Sharon St. George. Here’s a little more about Sharon. Sharon Owen, writing as Sharon St. George, is the current program director of Writers Forum. 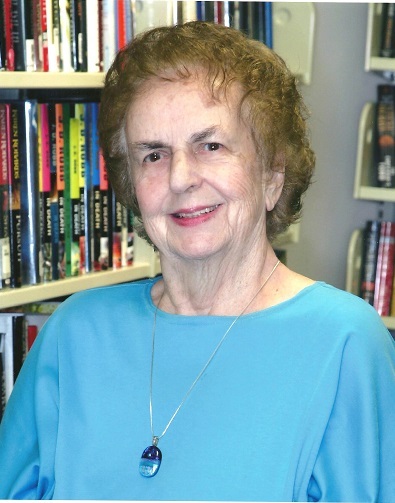 She is also a member of Sisters in Crime and Mystery Writers of America. Visit Sharon at www.sharonstgeorge.com or on Facebook at Facebook.com/sharonstgeorge. proclivity that, on more than one occasion, caused him to behave in an unethical manner. of the story setting. Without it, there would have been no story. behaviors from society at large, even when they do not fall under the purview of law. themselves and others who share not only their community, but their nation and their planet. In Breach of Ethics, Sharon St. George’s third novel in the Aimee Machado Mystery series, a troubled surgeon faces an ethical dilemma while operating on a ten-year-old girl. His efforts to save the life of the child prodigy pianist result in ominous consequences involving Aimee and her band of intrepid crime solvers. Breach of Ethics will be released by Camel Press on May 1, 2016. It is available now to preorder from Amazon and Barnes and Noble in paperback and eBook format. Welcome back to Member Monday. Today we feature a piece by Writers Forum member and newsletter editor, George Parker. Welcome, George. Rock work comes easier for some people than others. Some people pick it up right away. A few never get the hang of fitting rocks together without the benefit of concrete or mortar into an immovable wall. Most of us only get it after a long hard struggle learning how to talk to the rocks. Ella was a Corpsmember from Del Norte. She had been on John Schwabe’s ‘Fishhead’ crew. Schwabe was a fisheries biologist, and most of the projects his crew was assigned were salmon habitat restoration projects in the north coast watershed. Ella had thrived at Del Norte. She had a hippie spirit that appreciated the concept of ‘giving back to the Earth’. Her ambition had been the Backcountry Trails program from the day that I met her at Del Norte. I had already worked my two years as a regular CCC corpsmember. When I met Ella I, I was a staff member. I was a fisheries special corpsmember, liaison between the CCC and the Department of Fish and Game sponsor, and technical adviser on fisheries projects. I frequently worked with Schwabe’s crew on fisheries projects. Ella was outgoing and sociable and friendly and really wanted to make a difference in the world. She was a hard worker who always pushed her five-foot-two-self to be better, faster, and stronger. Ella was chosen for the Backcountry Trails program and assigned to one of the two Kings Canyon National Park crews. I had decided that it was time to move on from fisheries and had applied for trails jobs around NPS. I was hired by Kings Canyon. Ella turned out to be on the CCC crew that I was going to work with. This was a good thing! Ella fit in very well with the camp life and culture of a Backcountry trail crew. She worked as hard as anybody on the crew. Her high spirits saw her though the trials of a first season on a Backcountry trail crew. Ella had only one thing dogging her. She just could not get the hang of rock work. Laurie Church, our NPS foreman, and Eric Vanderleest, our NPS maintenance worker, spent a lot of time with Ella, trying to teach her how to fit rocks together that did not look like they wanted to fit together. Ella would appear to understand, and Laurie or Eric would leave her to finish the section, but when they would come back to inspect the work, the rocks would be too loose and unstable to be acceptable. When a section of rockwork was finished, you needed to be able to kick the rocks and jump on them and not have them budge. Ella wasn’t getting there. Eric would test kick her work and rocks would move. Ella started getting frustrated with her progress. Eric started getting frustrated. Words were exchanged. Tempers flared. Life did not feel good around Ella’s rockwork. By the August dog days of the season, our trail maintenance had progressed above Rae Lakes and was heading towards Glenn Pass. Crewmembers by now were getting enough experience with rockwork that the good ones could be left more or less on their own. Eric and I were running corpsmembers in several sections of the trail. One morning Eric and I hiked out of camp ahead of the crew and he lined me out on what he wanted done that day. One section just needed eight or nine feet of single tier wall. Eric told me to have Ella just piss ant the rock down for the project, but he expected me to build it. Eric and I continued up the trail around the bend about thirty yards, and he showed me where he wanted a multi-tier wall on a switchback. Eric continued up the trail to his worksite. I went back to the first worksite, where I met Ella on her way up the trail. Ella mumbled “Sure”. She looked like an exhausted late season corpsmember. For the most part, she looked like everyone else on the crew at that point of the season. ‘Clean uniform’ had become a relative term. Dirt was ground in to her khaki uniform shirt under her daypack straps, leaving black lines around her shoulders that were never going to come out…not even when we got back to washing machines. Her blue CCC hard hat was on her head but pushed back off of her forehead, sweat damped hair peeking out across her forehead. She had leaned out over the summer. She was more solid, and could perform feats of strength and endurance she had never thought possible for herself. One thing was different between Ella and the rest of the crew. I could tell the difference in the sloop of her shoulders and the exhaustion in her eyes. Her face was drawn. Her eyes had a vacant stare. I had been in the same condition before in Yosemite. I think she had hit her wall. The wall is that point in a trail worker’s first season when you reach a point of exhaustion at which you are not sure you will be able to physically finish the season. You are emotionally drained. The muscles protest at being pushed so hard. The stress of living with the same twenty people or so all summer takes its toll, and all you can think of is returning to civilization, to showers, TV, and restaurants. Ella displayed all of the symptoms on that day. Ella nodded wearily as she dropped the rock bar and shovel off her shoulder. Ella nodded again and started up the hill to gather rock. I hiked down to my section and started rolling likely rocks down the hill to the site. By the time I had all of my rocks together, I decided that it was time to go check on Ella. Not only did Ella have all of the rock gathered, she had already laid three rocks for the wall. I was surprised because I hadn’t told her to build the wall. Then again, I hadn’t told her not to build it, either. Ella was on her hands and knees chipping a rock with a single jack as I approached. She looked up, and when she saw me, she straightened herself up and stretched her back as I inspected her work. I expected loose rocks and lousy contact. What I found were three good rocks in a wall. Good contact all the way around where the rocks touched each other. They had a good foundation back into the trail tread. I kicked the first two rocks. Solid. They didn’t budge. I didn’t kick the third rock because it wasn’t tied in to a fourth rock yet. That was the one Ella was shaping to fit. Ella sipped water from her canteen as I looked at her wall. I thought the compliment would cheer Ella up, but it didn’t seem to. She just nodded and took another sip of water. I looked the wall over again, and considered Eric’s instructions. He hadn’t expected Ella to be able to pull this simple wall off, and he had expected me to build it. But Ella was doing a good job here. I decided to let Ella finish. Ella just nodded again and put her canteen down. She began chipping away again at the next rock to go into the wall. I went back to my project. He looked around for Ella and brought her over to the section. She looked just as fatigued as she had that morning. Same sagging shoulders. Same drawn face. I am certain that on that day Ella burst through her emotional wall by building a good rock wall. Her spirits picked up after that day. She laid more rocks. Good rocks. As a testimony to how good Ella became at rock work, Kings Canyon National Park hired her the next season as a regular trail worker. Yep. She got my job.